Abana acts on lipids. It decreases total cholesterol, triglycerides, and bad cholesterol and helps in normalizing lipid profile. along with this, it also lowers blood pressure, so it can also be used in mild to moderate hypertension and as supportive therapy for hypertensive patients with uncontrolled hypertension. Gojihva – Onosma Bracteatum Q.S. Amalaki (Amla) –Emblica Officinalis Q.S. Mandukaparni (Gotu Kola) – Centella Asiatica Q.S. Satapatri (Damask Rose) – Rosa Damascena Q.S. Kamal (Lotus) – Nelumbo Speciosum Q.S. Dadima or Anar (Pomegranate) – Punica Granatum Q.S. Sevam (Apple) – Pyrus Malus Q.S. Shankhpushpi – Convolvulus Pluricaulis Q.S. Shatavari – Asparagus Racemosus Q.S. Kumari or Ghritkumari or Gwarpatha – Aloe Vera Q.S. Badranj Boya – Nepeta Hindostana Q.S. Tulsi (Holy Basil) – Ocimum Sanctum Q.S. Shatapushpa or Saunf (Fennel Seeds) – Foeniculum Vulgare Q.S. Ushira or Khas (Vetiver) – Vetiveria Zizanioides Q.S. Garijara (Gajar) – Daucus Carota Q.S. 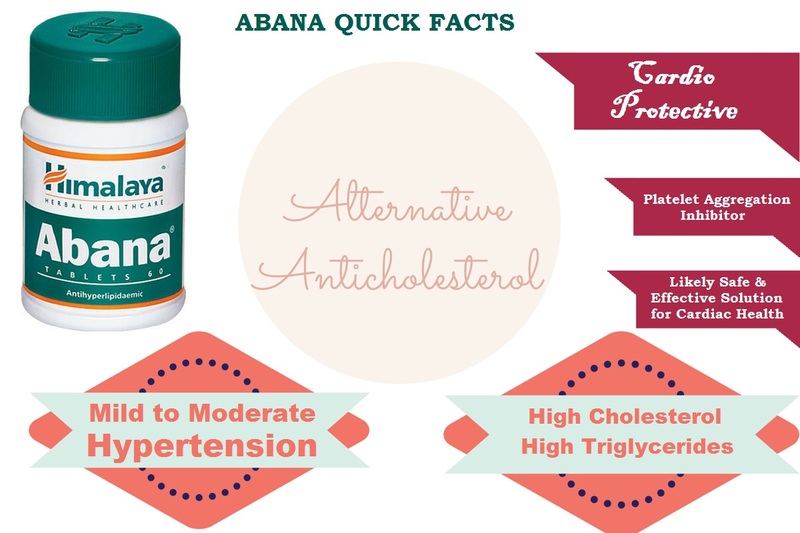 Abana is an effective solution for elevated lipids and mild to moderate high blood pressure. It is commonly used for these health conditions in India and the results are very promising. However, it is not effective in severely hypertensive patients, but it can be used in them as an adjuvant for supporting cardiac health and preventing cardiac complications. All these three conditions have similar meaning with a slight difference. In all these conditions, Abana works well and is used as a first-line treatment in some ayurvedic clinics. Many ayurvedic doctors use Abana along with Lipistat manufactured by Dabur or with Arogyavardhini vati. In obese people, Abana is used with Medohar guggul for best results. Abana contains some herbs that act on serum lipids and help in normalizing and regulating them. Abana reduces LDL (bad cholesterol or low-density lipoprotein), triglycerides levels, cholesterol levels, and VLDL (very low-density lipoprotein). Abana also has positive effects on good cholesterol (HDL – High-density lipoprotein). It raises its level and helps to protect the heart and blood vessels. Nowadays, Abana has become the first choice for managing mild to moderate hypertension in most of the ayurvedic setups. It has antihypertensive effects, which can reduce heart sensitivity to adrenergic-stimulation. Abana helps to stabilize high systolic blood pressure and diastolic blood pressure both. Editor’s Comment: We have found Abana more effective in high blood pressure when patients have associated high cholesterol levels or abnormal lipids. Abana has a positive influence on heart and blood vessels and normalizes heart functions by reducing physical, biological and chemical stress. It is one of the most common health condition related to platelet function disorders. Abnormal platelet adhesion and aggregation increases the risk of cardiovascular and cerebrovascular diseases. Abana acts as inhibitor for Platelet Aggregation, so it is also beneficial in reducing the risk of cardiovascular and cerebrovascular complications. The effective dosage is 2 tablets twice a day until normalizing the lipid levels. After that, the patient may require to take one tablet twice a day as a maintenance dose. Abana appears to be POSSIBLY SAFE when taken as per its dosage. There are no adverse effects reported with Abana use in most people. 3 to 6 months therapy with abana helps reducing triglycerides and cholesterol significantly. I am Dr.Selvakumar, Dentist. I want to buy this Abana tablet for my father aged 75. Abana main composition good. But processed pearls, processed agate, processed saffron & ruby are also added. I Want to know whether these mineral product will damage kidney function. Kindly explain & also explain the dosage of these drug as my father have BP, Cholesterol, blood sugar. Generally, these things contain calcium, silicon dioxide, etc. and do not contain heavy metals. Secondly the individual quantity of these ingredients in Abana is insignificant to cause any side effect. Therefore, these compounds do not likely to alter or damage the kidney function and Abana is likely to be safe for the long-term use. The optimum dosage for Abana tablet is 2 tablets twice daily. Sir, if we are already taking allopathic medicines for BP, then how should we use Abana? Can it be taken along, or should we discontinue the allopathic medicines? How long period will use tab Abana. After normalizing lipid, can this tab cure from the root of this disease? 1. In most cases, Abana provides good results within 3 to 6 months of its regular use. Some people may need it for a longer duration depending on the health condition. If it is used for hypertension (high blood pressure), then it can be taken on regular basis as other antihypertensive drugs are taken without any restriction under supervision of an ayurvedic doctor. 2. In most cases, it provides a complete relief from Hyperlipidemia within 3 to 6 months provided you also have changed your diet as per recommendations. Could you please advice for patient having age 32 years having cholesterol high from last 4-5 years Total Cholesterol 225-235 and fatty liver? I have looked at the ingredients for both Hridyamrit and Abana. I trust the makers of both medicines, but to me, Abana appears to be a superior formula, with more ingredients and greater quantity of the mineral ingredients. I’m interested to know your opinion about this. Is there any reason to think that Hridyamrit would be preferable in some cases? I have palpitation problem, it has happened to me twice, I am taking English medicine once a day, I am ok but is there a permanent cure in Ayurveda for this. I do yoga now and more fruits and vegetables, taking lauki juice with mint and ginger daily, walking etc. but this medicine makes me weak and tired. I had my echo stress test which was normal, my lipid profile is normal and no thyroid problem. I only have high cholesterol and high weight. My BP is normal. Is abana safe for me? Can it be discontinued after treatment or will I have to depend on it? Abana should be discontinued after the treatment. Is it safe to give at this blood pressure. I M 50YRS having moderate-high cholesterol problems genetic can it be reduced to normal by Abana. Hi sir..I have been using Arjuna by Himalaya for 3 months now…It seemed that Abana from the same company is more superior based from the ingredients listed. Should i use both because Abana is claimed to reduce cholesterol too where Arjuna may not function like that,(I doubt that it could)..Or should I stop consuming Arjuna and just focus on Abana? Pls tell timing to take Abana combination of Abana and liv 52ds is good for high cholesterol and high triglycerides and fatty liver? The best time to take Abana and Liv 52 DS is before a meal for high cholesterol, elevated triglycerides and fatty liver. However, if you are prone to hyperacidity, gastritis, burning sensation, then you should take it after a meal. My age is 34 and recently detected with high cholesterol 282 and high sugar HgA1c 6.7. Can Abana and Diabecon be taken together and in what doses? Can I use it daily till I get old or should I stop using it? I have been using it for 3 months. I’m a smoker and usually my BP gets high a bit 130/90. Please respond. Abana can be taken for long-term. But I suggest to stop it for 2 weeks after every 6 months.